TOP GUN® is the number one acrylic coated fabric on the market. More people ask for TOP GUN® by name than any other acrylic coated polyester fabric. Many have tried to imitate TOP GUN®, but none have succeeded. 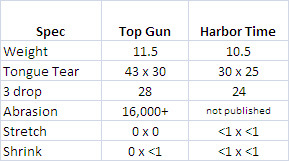 As you can see from the chart, Harbor Time® does not match TOP GUN's® performance. Get a sample of TOP GUN® and find out why it is #1. Harbor Time specs taken from the 2009 Marine Fabricators Buyers Guide.